Objectives: Systemic mastocytosis (SM) is a myeloproliferative disease characterized by the accumulation of aberrant mast cells. Since advanced subtypes of SM can lead to organ dysfunction and shortened survival, timely recognition of progressive disease is important for the adequate treatment of SM patients. 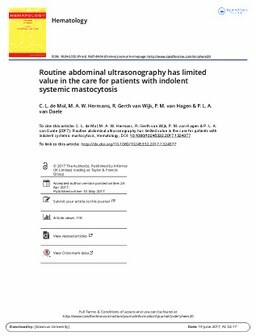 Methods: Here, we report the results of our cohort study on the value of routine abdominal ultrasonography for the detection of progression of indolent systemic mastocytosis (ISM). Results: We included 88 patients with ISM, of whom 9 developed new hepatosplenomegaly during follow-up. In this group, the median serum tryptase level increased by 11.60 μg/l, compared with a decrease of −0.20 μg/l in the 79 patients with unchanged ultrasonography results (p = 0.016). A change in liver and/or spleen size never led to a change in clinical classification, nor management. Discussion: Based on the finding that a change in ultrasonography findings did not correlate to disease progression in general, it appears that isolated hepatosplenomegaly does not have prognostic implications in patients with ISM. Conclusions: Routine abdominal ultrasonography is redundant in the follow-up of patients with ISM. A combination of physical examination with serum tryptase levels can be used to screen for hepatosplenomegaly.